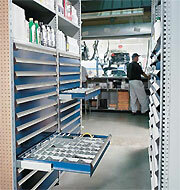 By adding modular drawers to, you recoup up to 70% of floor space vs. shelving alone. R5LEC-1801 36"W x 18"D x 18"H 4 Three 4" and one 6"
R5LEC-2401 36"W x 18"D x 24"H 5 Three 4" and two 6"
R5LEC-3601 36"W x 18"D x 36"H 7 Three 4" and four 6"
R5LEC-3603 36"W x 18"D x 36"H 7 Four 4", two 6", and one 8"
R5LEC-4805 36"W x 18"D x 48"H 10 Six 4" and four 6"
R5LEC-4807 36"W x 18"D x 48"H 11 Four 3", three 4", andfour 6"
R5LEC-4801 36"W x 18"D x 48"H 8 Eight 6"
R5LEC-4803 36"W x 18"D x 48"H 9 Four 4", four 6", and one 8"
R5LEE-1801 36"W x 24"D x 18"H 4 Three 4" and one 6"
R5LEE-2401 36"W x 24"D x 24"H 5 Three 4" and two 6"
R5LEE-3601 36"W x 24"D x 36"H 7 Three 4" and four 6"
Note that many other brands, styles and types may also retrofit; contact us for assistance. If your shelving isn't listed, please contact us. Many brands of shelving are compatible, but before you purchase, please let us help you be sure your shelving is compatible with the modular drawer system.